simon says | bahá'í children's class ideas! Simon Says is a game for three or more players, where one player takes the role of “Simon” and issues commands to the other players, which should only be followed if prefaced with the phrase “Simon says”, for example “Simon says jump in the air”. 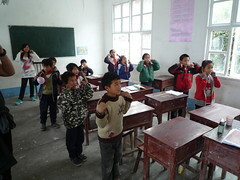 Players are eliminated from the game when they: 1) follow commands that do not start with “Simon says”, or 2) fail to follow an instruction which does start with “Simon says”. Children do not have to complete the commands accurately, especially if they are not physically able (i.e. “touch the sky” or “touch your nose with your tongue”); the important thing is that they are able to distinguish between valid and invalid commands. The object for the player acting as “Simon” is to get all the other players “out” as quickly as possible, and the winner of the game is usually the last player who has successfully followed all of the given commands. Occasionally however, two or more of the last players may all be eliminated by following a command without “Simon Says”, thus resulting in no winner at all. A recent psychological study found that the game can be a healthy way to help children to improve self-control and restraint of impulsive behavior. To give the children a pre-game warm-up, start by giving the commands without “Simon says”. Instead of using “Simon says” as a keyword, use “please”. For example, children should jump at the command “Jump up in the air, please”, but if they jump at the command “Jump up!” they are out. For an added challenge, use “thank you” to indicate that they may move to the next command. If they obey the next command without hearing “thank you” first, they are out—even if the command included the keyword “please”. Based partly on content from Simon Says [Wikipedia].